To cook the corn, you can grill it or boil it. 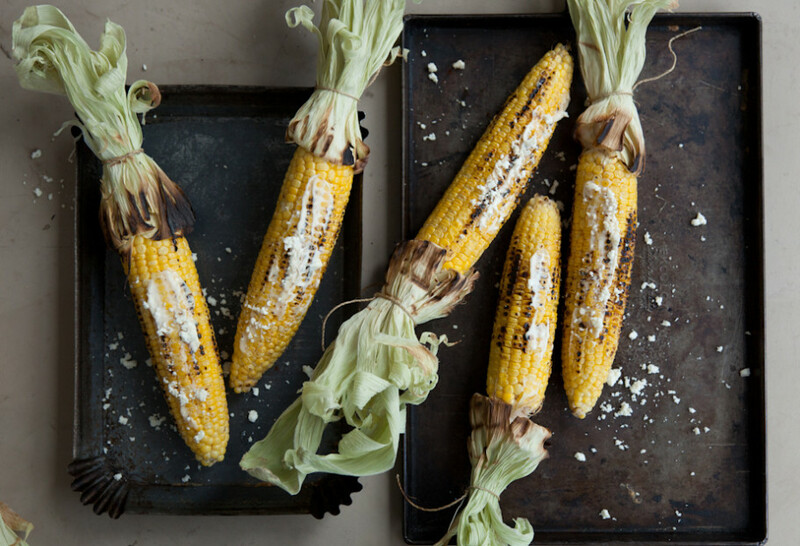 To grill, brush the ears of corn with a bit of oil. Place them over a grill or grill pan, set over medium heat, and let the corn cook and char slightly, turning every 3 minutes until all the corn is done, anywhere from 9 to 12 minutes total. Remove from the heat. You can also cook the corn it in boiling water until soft and cooked, less than ten minutes. Once cooked, stick the corn on corn holders or a wooden stick. Choose your toppings! Traditionally in Mexico, we: spread butter, then a layer of mayonnaise, coat thoroughly with crumbled cheese, sprinkle with salt and ground chile and finally, drizzle with freshly-squeezed lime juice. I love this corn. Would love ideas on what to serve with it to make a complete lunch or dinner. So many things would be great…like: https://patijinich.com/recipe/chicken-flautas/ or any of my enchilada or taco recipes…or a salad. Made these for my kids and they were a hit. That’s awesome, Peter! I hope you and your kids enjoy many more recipes. I can’t wait to serve it to other people. And its so easy, and really you could call it a meal. Try it, you’ll love it! Oh I hope everyone likes it, Linda! I have to admit I have never had ‘Crazy Corn’. Originally from, New England, our go to food is seafood: crunchy fish sandwiches with tartar sauce, clam cakes and fried clams (Yummy and awesome). Like you, one has to find the time to wind down and reflect. Therefore I will be making that corn. In addition, I have no excuse not to…living in Cali. Enjoy your summer. So happy to hear you will be making this corn, Rosanna! Have a great summer too. Thank you for your wonderful receipes. I love these! They have become a family favorite – with all the fresh corn available in the market. I turn the mayo, cotija, and spices into a sauce. I add some heat with a hot sauce (I like Louisiana) and some chopped cilantro for color. I slather it all over the corn and go. Messy, but delish! So glad you have a new season coming up, Pati. Hola! Louisiana hot sauce is really good, Carol! And I’m so excited to bring you the new season. Yum! Pati everything you make looks so delicious! Plus when I make your recipes they always turn out sooo good! Thank you Pati you’re the BEST! In Laredo Mexico we eat the corn with mayo,Limon, parmesan,or crema instead of mayo and tarin that is for fruits. It is spicy and sweet. This is my favorite way to eat corn ; this exact recipe less the butter. Great stuff! Yes. From your first book. Exciting recipe. Glad you are working on a third book!!!! I love elote! I just had an ear from a vendor & was wondering about the cheese & chili. thanks! Oh I hope you have fun making these at home, Ruby!